As a hard-playing, hard-living rugby forward, Sean Smith was used to putting his body on the line. However, that soon changed when two severe motor-vehicle accidents left him with devastating physical injuries, and unable to regain his past physical fitness or his zest for life. After witnessing firsthand the 2002 Bali bombing, Sean also found himself suffering from post-traumatic shock. Compulsively working long hours in a stressful job and battling to find time to be with his wife and two small daughters didn’t help either. A losing battle against obesity and an ongoing struggle with depression followed. After being told by doctors he was a prime candidate for a heart attack at just 36, Sean decided enough was enough. He took up kayaking (a sport that could accommodate his injuries) and then decided to tackle one of the toughest paddling competitions in the world: the 111-kilometre Hawkesbury Canoe Classic. Sean’s story is an uplifting experience for those looking for motivation to regain their fitness & enjoy life to the full. Der er altid hjælp. Et af håndtagene på vejen tilbage, er oplevelsen af at ” jeg kan sgu” og så ude i den frie, gratis og tilgivende natur som der er så meget af. Is there an ebook release? I’m really looking forward to reading your book, FP. No easy walk to freedom, and I have no doubt that your story will be an inspiration to others, particularly those, like myself, who have struggled with injury and depression Thanks for having the courage to share it with the world. I want an autographed copy. How do I get it? ive ordered my copy!! cant wait to get my hands on it!! congrats again sean. luv ya work big guy!! Just Got my copy! Excited to Read it!!! Hey Sean – any word on an ebook release? Kindle? Would love to read the book. Used to be a second rower, spent many a long day holding you fat bastards up in the scrum. Any chance of me coming over to be part of the Fatpaddler team for a Hawkesbury in 2012 or 2013? Sat by the pool today reading your book. wish i put on sunscreen. Upto chapter 13 so far its a great read. loved it from the first page. Look forward to following your adventures, form a new big fan, Peter from the N.T. Hey Sean, where do I get large ‘Fatpaddler.com’ stickers for my kayak ?? I’m 130 kg so I qualify! And why do those ‘reCAPTCHA’ (stop spam) code things have to be so difficult to read?? I spend half an hour finding a word I can actually read! 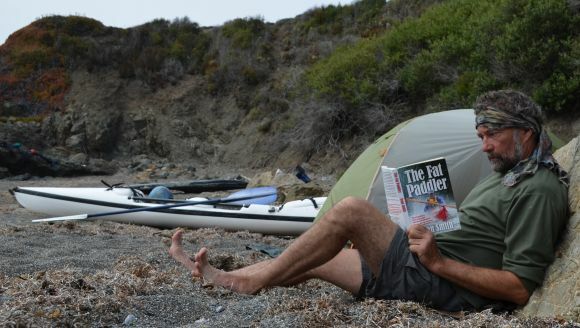 Man oh man – if ever you were to give a great read to a friend who needs to look at the real world – Fat Paddler is it. Small problem – got it Friday, drove to the bush for a quiet weekend, read it Saturday and had a really quiet, perhaps icy -just like the book – trip back to civilisation. A great read, inspirational story about facing up to the real world. Sean, just downloaded and will start reading tonight. Thanks! Hi Sean – Thank you for the inspirational account of your journey to become the Fat Paddler. It has prompted me to get back on the water after a 30 year hiatus from my days with Surfers Paradise SLSC. After 3 Heart Stents, a hip replacement and a knee reconstruction and a bout of Pleurisy I’m ready to reclaim my paddling prowess. Hi I would like to buy your book in hard cover – where is it available from in Australia ? True, recovery from Depression, finding the way to freedom and happiness to oneness to sensibility is a adventure and is a nice healing process… It is good that kayaking and outdoors brought the zest of life back to this person and he will be part of happy family.